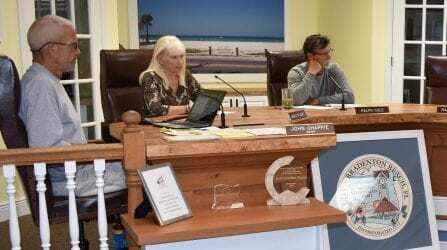 BRADENTON BEACH – Bradenton Beach commissioners have rejected the settlement counteroffer proposed by the six defendants in the 2017 Sunshine Law lawsuit. The defendants had until midnight Monday night to accept the city commission’s March 1 settlement offer and did not do so. On March 12, the commission voted 4-1 to reject the defendants’ counteroffer prepared by attorney Thomas Shults. Shults represents John Metz; the counteroffer was also approved by co-defendants Reed Mapes, Tjet Martin, Patty Shay, Bill Vincent and Rose Vincent, and included a March 15 deadline. The commission majority opted instead to stick with the settlement offer the commission unanimously authorized on Feb. 28. The defendants’ counteroffer said, “errors may have been made,” which was deemed unacceptable by Mayor John Chappie and commissioners Ralph Cole, Marilyn Maro and Jake Spooner. The city’s offer proposed that the defendants pay the city $500 each or $3,000 collectively. City Attorney Ricinda Perry said that amount was in accordance with Florida Statutes. The defendants’ counteroffer proposed that they collectively donate $10,000 to the Annie Silver Community Center and encouraged the city to do likewise. The civil lawsuit filed by the city and co-plaintiff Jack Clarke seeks a judge’s ruling as to whether the six defendants – all of whom were commission-appointed city advisory board members at the time – violated the Florida Sunshine Law by discussing their official city business outside of properly noticed public meetings. 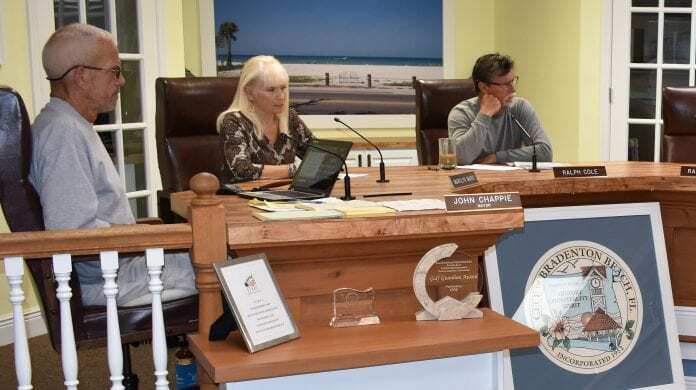 Those 2017 discussions occurred during Concerned Neighbors of Bradenton Beach (CNOBB) meetings at the Annie Silver Community Center, the Pines Trailer Park and through private email exchanges. Those email exchanges and recordings of the CNOBB meetings were later obtained by the city’s legal team. During the work meeting, Perry said Shults and Mapes’ attorney, Jim Dye, asked her to ask the commission if the “acknowledgment of errors” language was negotiable. “I think we’ve been very consistent with our settlement offer with regards to acknowledging errors were made. Nothing’s changed,” Chappie said. Participating from afar by cell phone, Commissioner Randy White expressed support for the counteroffer. “Let’s just break bread. I think we should just close this out,” White said. “We didn’t ask them to have meetings outside of city hall. We didn’t ask them to do any of the stuff they allegedly did,” Cole said. “I do think they do need to acknowledge they made mistakes. ‘May’ is not there, it’s a way to put a spin on it,” Cole added. Maro said she thought the city’s offer and the request for an admission of errors was fair. “This is our best offer. 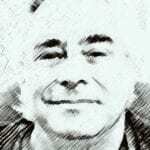 It’s not going to get any better,” Spooner said before the votes were cast. “I think it’s pretty clear, our motion stands as is,” Chappie added. After the meeting, Perry emailed Shults and Dye and informed them the commission was unwilling to negotiate further.